Along Trout Pond road there is a small, well kept cemetery with a few scattered stones. The historical marker tells the visitor that it is the "Pioneer Cemetery", the resting spot of many of the early settlers of the Falls area. Some accounts have the first burials on the lawn south of the Glen Iris; Mrs Anderson stated that "it is thought by some of the older residents of the area that Mr. Letchworth had the bodies removed..." She went on to suggest that this reburial would explain why there were so many unmarked graves in the Pioneer Cemetery. The following is a list of the graves that are marked in the old Cemetery. The list is from Mrs. Anderson's Genesee Echoes. She told me in the late 1970's that when she was doing research for the book she had to crawl on her hands and knees through the brush and berry bushes to record the information on the stones, many of which were knocked over and broken. 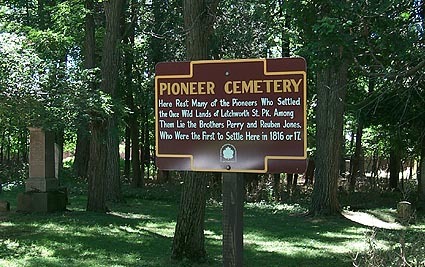 Due to her efforts, the Park cleaned up the Cemetery and placed a historical marker on the site. During the recent Centennial Celebration the Park placed a new interpretive sign at the cemetery which provides additional insight into the pioneers who rest there. Harriet, dau. W.T. & M.F. Davis, d. Dec.2, 1817. Maria A. Davis, dau. W.T. Davis, Nov 25, 1836-March 15, 1915. Asel Fancher, d. Jan. 31, 1863, 77y 8 m.
For more information on the pioneers of Letchworth Park go to the Glimpse of the Pioneer Era or the Short History of Letchworth Park.